The anger can also be gauged from the fact that the BJP suffered electoral losses in Gujarat's cotton-belt in the assembly elections earlier this month. NEW DELHI: Pavitra Singh of Punjab's Mansa is representative of farmers across the country who were infuriated as agriculture prices collapsed for the second consecutive year, but their sufferings remained unnoticed until the June police firing in Madhya Pradesh's Mandsaur district that killed five farmers. The episode, which led to many subsequent protests across the country, provoked the aggrieved farmers to vent their anger over the agrarian distress, mostly caused by the November 8, 2016, demonetisation that crippled the rural economy. Farmers were unhappy over the non-fulfillment of the 2014 campaign promise by the Bhartiya Janata Party (BJP) that they would be able to make a 50 per cent profit over their input costs -- especially as the situation got aggravated by the huge fall in prices to the extent that many couldn't even recover their input costs. "Leave alone the big promises, we did not even receive the MSP (minimum support price) for the grain we produced. We did not have funds for the next sowing after the demonetisation struck us. We are facing huge difficulties in repaying our loans," Pavitra Singh lamented while speaking to IANS. He said farmers in his area were forced to sell their rice at Rs 1,200 to Rs 1,250 per quintal as there were no takers for the MSP of Rs 1,510 fixed by the government. Agricultural economist Devinder Sharma said the government's farm polices, especially those related to imports and exports, went awry to a "large extent" and led to prices in the local markets dropping. "There are two major reasons for farm distress -- demonetisation and the crashing of the international market. The government imported pulses, wheat and coconut when the local production was, in fact, high. The volume of imports was more than the total agriculture budget," he said. Maharashtra and Madhya Pradesh witnessed a number of protests this year over the slump in prices of pulses -- mainly arhar (red gram) -- after the government stopped their procurement. 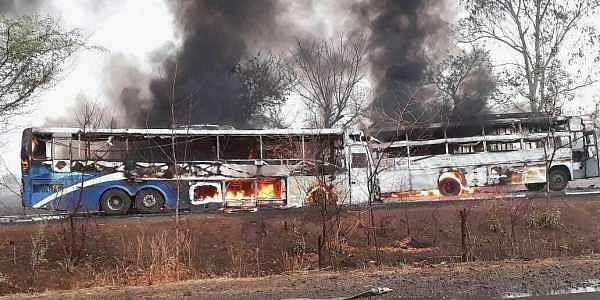 Thus, while it had been smooth sailing on the agricultural front for the BJP government at the Centre for almost three years since it came to power in 2014, the Mandsaur firing could be seen as the turning point, with the negative cascading effects, including the consolidation of farm unions and opposition parties on the issue and some prominent allies quitting the ruling alliance. Lok Sabha member and Swabhimani Shetkari Sanghatana leader Raju Shetty left the BJP-led National Democratic Alliance (NDA) in July after the government did not entertain the farmers' demand of a countrywide loan waiver and remunerative prices for their produce. "I had pleaded with the government to provide financial help and assure remunerative prices for farm produce. However, the government did not act. So I had no option but to leave them to ensure justice for the farmers," Shetty told IANS. Another big jolt was when Nana Patole, BJP MP from Maharashtra, resigned from the Lok Sabha and left the party. While farmers across the country were mourning the death of their brethren in Mandsaur, Union Agriculture Minister Radha Mohan Singh had different priorities -- he chose to participate in an yoga event the very next day after the incident. This only added to the government's image as anti-farmer, which was quite evident during farmers' agitations. "We held protests in Delhi for over 100 days for our demands and many supported us during the difficult time. However, Radha Mohan Singh neither visited us nor invited us to discuss our issues," said P. Ayyakannu, leader of 100-odd Tamil Nadu farmers who attracted eyeballs with their strange and innovative protests. Parts of Tamil Nadu and Southern Karnataka have been reeling under severe drought for some years owing to a shortfall in the monsoon. Barring a few exceptions, Swaraj India leader Yogendra Yadav managed to bring almost all concerned organisations under one umbrella -- 184 in the recent one -- to hold nationwide protests and the government was seen struggling to cope up with them. In the mega protest held last month, around 20,000 farmers across the country hit the national capital to press their demands. Dharmalingam, a farmer from Karnataka's Kolar district, said the government was seen in advertisement blitzes promoting new schemes for farmers, but their benefits hardly reach those for whom they are meant. "A number of schemes have been launched so far in order to supposedly double our income. However, none of them has had any palpable impact so far," Dharmalingam told IANS.